income in a low-income world! The High Income Factor has one mission: to help investors generate high income in a low-income world. ith typical savings accounts earning less than one percent and short-term CDs earning not much more, keeping your money in these types of accounts means you are losing ground to inflation each and every year. This means all investors — from those just starting out to those already in retirement — who count on this income to make ends meet each month are in desperate need of a safe and steady income stream. 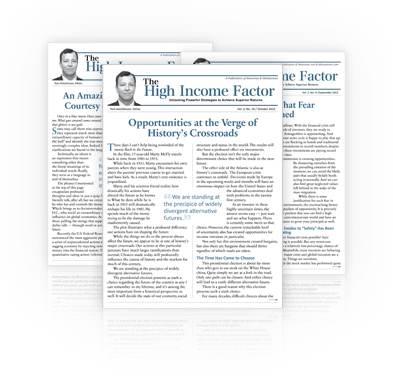 Fortunately, Tom Hutchinson has created The High Income Factor newsletter specifically to deliver these types of income-generating ideas each and every month. His newsletter looks at the entire investing landscape to identify the most profitable, yet conservative, income opportunities available today. The High Income Factor includes high-yield investments that you are very familiar with, such as dividend stocks, corporate bonds, and real estate investment trusts (REITs). But Tom also covers unique income-generating investments such as master-limited partnerships (MLPs), business-development companies (BDCs), as well as capital and income funds. As a member, you are able to take full advantage of having a Wall Street “insider” working for you each month, delivering exciting opportunities that you won’t hear about in the mainstream financial press. Partner with Tom and start putting these high-income plays to work for you today!